Do you really enjoying sleeping and napping and generally lazing around? Well, make sure to mark January 3rd in your calendar, as it’s Festival Of Sleep Day! The idea behind the hashtag holiday is to catch up on any sleep or rest you might have missed during all the hullabaloo of the holidays. Of course, if you’re a cat, stacking up your daily sleeping hours is not exactly much of a hardship, as these five videos of cats deep in sleep show. Not only does this dinky kitten sleep while on her back, she’s so zonked out that her human is able to move her paws and tail around as if she’s a doll. Apparently, a hearty milk session is the cause behind the super deep sleep. Next up we have another kitten engaging in some entertaining sleep shenanigans. This time we’re talking about a ginger kitty whose angle — literally — is to sleep face down while totally bent over forwards. Over in the world of adult cats, we find this fine slumber master who not only becomes totally pliable while sleeping, but also emits a loud but comforting purr. Make sure to turn your volume up for this one. 4. Don’t Wake The Zombie Kitty! Now we come to a laid-back Persian who’s all about napping while, er, looking like something from a feline zombie movie. The one-eye-open and tongue-out-to-the-side look is an acquired taste. Finally, let’s salute a cat named Sophie who’s so about her napping that she has secured a tiny bed to sleep in, and she tucks herself into it each and every night. Does your cat sleep in a funny manner? 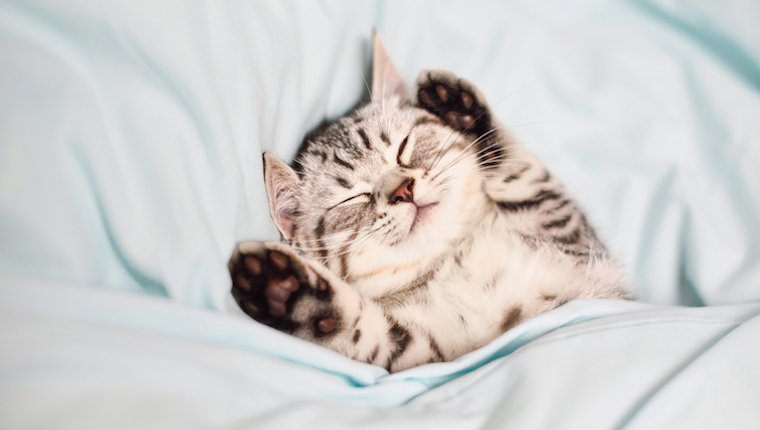 Do you think your cat will be catching some extra snoozes on Festival Of Sleep Day? Let us know in the comments!